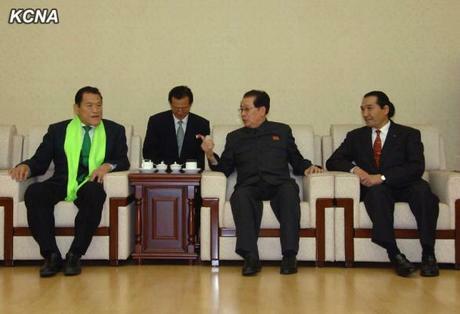 Jang Song T’aek (C) talks with Kanji (Antonio) Inoki (L), a member of the House of Councillors, and Kenshiro Matsunami (R), Chancellor of Nippon Sport Science University in Pyongyang on 6 November 2013 (Photo: KCNA). Jang Song T’aek, Chairman of the DPRK State Physical Culture and Sports Guidance Commission and Vice Chairman of the DPRK National Defense Commission, met a sports delegation from Japan in Pyongyang on 6 November (Wednesday). Jang met with Kanji (Antonio) Inoki (Member of the House of Councillors), members of Inoki’s entourage, and a delegation of the Nippon Sport Science University led Kenshiro Matsunami (University Chancellor). Attending from the DPRK were Ri Jong Mu (Minister of Physical Culture and Sports), Kim Song Nam (Deputy Director of the Korean Workers’ Party International Affairs Department), Ma Chol Su (Secretary of the DPRK-Japan Friendship Association), Sin Tong Gyu (Rector of he Korea University of Physical Education) and other officials. 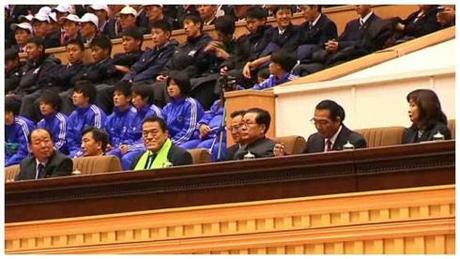 Jang Song Taek, Kanji Inoki and a Japanese sports delegation watch a women’s university basketball game at Pyongyang Indoor Stadium on 6 November 2013 (Photo: KCNA screen grab). Jang and the Japanese delegation also watched basketball games at Pyongyang Indoor Stadium. Also in attendance were “basketball experts, fans and citizens including students in Pyongyang.” The games were between DPRK and Japanese men’s and women’s university teams. According to KCNA “ players created chances for scoring through diversified and well-organized attack and accurate passes between two or three players to serve the teams’ tactical intention and that “spectators enthusiastically applauded the players when they scored goals.” Korea University of Physical Education won both games.